* Share price as of close on April 4, 2016. * Estimates are those of the Company. Effective from fiscal year May 2016, the definition for net income has been changed to net income attributable to parent company shareholders (Abbreviated hereafter as parent net income). This Bridge Report provides details of Nihon Enterprise Co., Ltd. and information pertaining to earnings results for the third quarter of fiscal year May 2016. Nihon Enterprise is a "mobile solutions company" with two main business segments including the contents services business, where various contents including traffic information, entertainment and lifestyle services are created and distributed to smartphones and other mobile devices, and the solutions business, where contents creation, operations, systems creation, affiliate advertising, reverse auctions, IP phones and other business support solutions (Cost reduction) are provided. Furthermore, Nihon Enterprise is also promoting efforts to expand its contents business from Japan into overseas markets and has established a business platform for the provision of Japanese contents in China and India. Nihon Enterprise's employees are committed to maintaining the basic corporate philosophy by repeatedly learning from the philosophy reflected in its "Mission Statement, Doctrine, and Five Spirits" and "Nihon Enterprise Management Principles." President Katsunori Ueda believes that it is Nihon Enterprise's obligation to maximize "shareholder value" and "make effective use of capital by not wasting a single yen". President Katsunori Ueda founded Nihon Enterprise with the strong motivation of "contributing to society through its businesses" and the Company pursues the achievement of this goal. Consequently, the Company seeks to contribute to society by increasing the satisfaction of its users through the provision of convenient information technology equipment and interesting and diverse contents and services. Based upon the management philosophy of President Katsunori Ueda, the bulk of the ordinary income earned in the founding year of the Company was donated to the Japan Red Cross Society, the Japan National Council of Social Welfare and various children's institutions. Also, donations were made to the Japan Red Cross Society at the time of the Great East Japan Earthquake to support the victims and the reconstruction efforts in North Eastern Japan. Nihon Enterprise vows to achieve the five commitments listed below in its pursuit of improving employment conditions. The Nihon Enterprise Group is comprised of a total of nine consolidated subsidiaries with seven within Japan including the company Dive Co., Ltd., which provides advertising services, At The LOUNGE Co., Ltd. which provides music related services, Advanced Traffic Information Services, Corporation (ATIS Corp.), which provides traffic and other information services, 4QUALIA Co., Ltd., which provides web and mobile site development and maintenance services and contents development, HigLab Co., Ltd., which conducts native application development as part of the mobile contents business, and One Inc., which provides voice communications related solutions, and Aizu Laboratory, Inc., which conducts smartphone application planning and development. The two overseas subsidiaries include Enterprise (Beijing) Information Technology Co., Ltd., , which oversees the operations in China and operates cellular telephone retail shops, and Rice CZ ( Beijing) New media technology Co., Ltd., which provides IT related educational services in China. The Group also maintains five non-consolidated subsidiaries of which three operate in Japan including Yamaguchi Regenerative Energy Factory Co., Ltd., which was established in June 2015 to conduct smart community business, Promote, Inc., which conducted a third party placement funding in July 2015 and provides development of applications for smartphones and automated kitting tools, and NE Yinrun Co., Ltd., which was established in October 2015 to provide wholesale services in China. In addition, two non-consolidated subsidiaries are operated in overseas markets including Rise MC (Beijing) Digital Information Technology Co., Ltd., which provides mobile contents distribution and character licensing services in China, and NE Mobile Services (India) Private Limited, which is a company operating in India. A characteristic and strength of Nihon Enterprise is its "devotion to in-house development". The Company maintains a unique strategy focused upon the development and ownership of its own contents created in house (Intellectual properties) as part of its unique business model. This strategy has also enabled the Company to expand sales of its performance based compensation (Success fees) contents through cooperation with cellular telephone sales companies to conduct affiliate program contents sales (Real affiliates developed independently). In addition, these experiences are leveraged in its mobile communications solutions for corporations. With a view to an expansion in the business realms due to the advance of the smart device age, efforts are being made to advance into new businesses and new technological realms. During the aggregated first through third quarters, efforts were made within the contents services business to strengthen the member acquisition for traffic information, and to fortify the entertainment and lifestyle contents lineup. At the same time, efforts to strengthen solutions (Consigned development, in-house services, regional economy rejuvenation), advertising (Advertising agency services), and overseas operations (Cellular telephone sales in China) have been implemented within the solutions business. 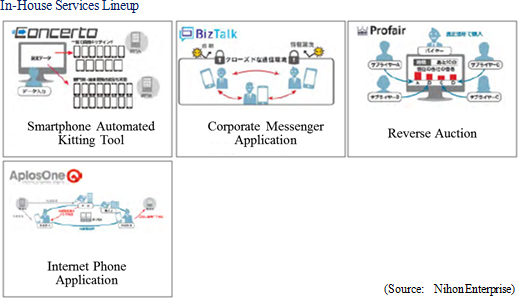 Acquisition of members smoothly progressed (200,000 total member numbers) on the back of preferred sales collaboration (Tie-up advertising promotion) with cellular telephone sales companies during the first half of fiscal year May 2016. Along with the start of new fee charge services to newly acquired members, sales, which had seen a bottoming in its decline during the first quarter of the previous year, saw a return to growth during the first quarter of the current fiscal year. Airport and shopping mall access road information will also be made available in the future within the solutions business. Within the entertainment category, Nihon Enterprise maintains a total of over 30 contents in popular genre are distributed across various carrier platforms, and is implementing efforts to distribute new contents through various alliances. "Kokoro to Shintai Music" music service, which had been distributed across au Smart Pass and App Pass platforms, also began being distributed across NTT Docomo's d Menu platform from February 15, 2016. In the lifestyle category, efforts will be made to establish the life support platform by strengthening of alliances and expanding coverage area. 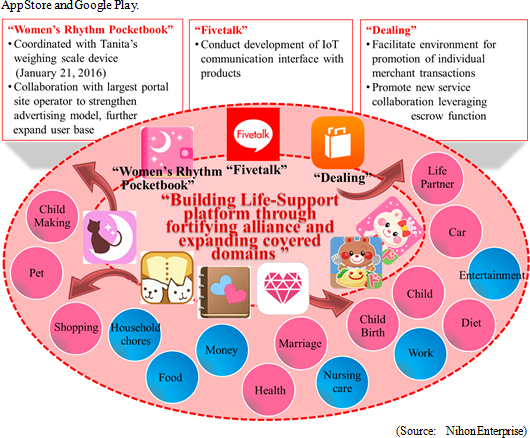 During the aggregated first three quarters, strengthening of "Women Rhythm Pocketbook", "Fivetalk", "Dealing" and other existing contents was conducted along with efforts to expand the coverage area, including the successful launch of "Everyday Dog and Cat Diary" distributed across carrier platforms (October 2 to December 17, 2015), and "Lets Make Kids' Lunch" and "Welcome to Prince's Room" distributed across App Store and Google Play. In addition, escrow agent services function are being fortified along with a growth in demand accompanying the growth in the EC market within the lifestyle category. Escrow is the service where a reliable third party (Agent) intervenes in the process to collateralize the transaction, and is offered as part of the "Dealing" (Product for sale free posting application) application. This service responds to growth in the individual to individual (C2C) commerce transaction market and reflects an expansion in the realm of services provided to individuals, in addition to measures to establish a commerce transaction and distribution system for retail merchants. The advertising (Advertising Agency Services) services encountered an increasingly difficult operating environment due to the strengthening of regulations of the communications services by the Japanese Government, and intensifying competition with carrier contents. However, Nihon Enterprise was able to achieve record high sales on a quarterly basis due to its efforts to "respond flexibly to changes in the market environment" and "implement various marketing measures" conducted during the third quarter (December to February). Specifically, the successful acquisition of "all you can watch movies, dramas and animations", "travel guides", "all you can listen to music", and other superior contents combined with growth in handset sales during December and January (Increase in demand accompanying "¥0" handset sales campaign and elimination of cash refunds) to contribute to success in marketing strategies. In addition, ongoing efforts to strengthen relationships with existing cellular telephone sales stores and measures to cultivate new sales channels (Other industry retail stores) leveraging the characteristics of contents contributed to the strengthening of sales channels. Efforts to cultivate corporate demand for handset terminals in the cellular telephone business in China allowed the sales volume of handsets to triple from the previous year in the overseas business. In the solutions business, efforts were implemented to strengthen in-house services and consigned development, and cultivate businesses that can contribute to rejuvenation of regional economies. The operating environment for consigned development was favorable on the back of an expansion in information system investments by corporations and intensified shortages of information technology engineers. During the aggregated first through third quarters, website creation for major esthetic beauty salons and major publishing companies, distributed computing system creation for game companies, and debugging services grew. With regards to new projects, validation services for carriers, hospital reservation system development project and consigned development and operations of interactive voice response (IVR) and web services were acquired. Progress was also made in cultivating new customers and demand at the end of the fiscal year in March. With regards to in-house services responding to the introduction of smartphones and tablets by corporations, the subsidiary Promote, Inc. saw favorable sales of kitting tools. Aside from the above mentioned services, a business and capital relationship was formed with Smartvalue Co., Ltd. on February 18, 2016 with the goal of strengthening solutions development and marketing capabilities, and collaborative research (Drones, HEMS, smart agriculture) was promoted with the cooperation of industry and academia. Smartvalue operates in the Kansai region (Osaka and surrounding areas) and provides cloud solutions and mobile related services. The business and capital ties with Smartvalue are expected to fortify marketing area coverage (Expansion of sales channels via advertising can be expected) and development capabilities of both companies. Various efforts to rejuvenate regional economies undertaken by regional government bodies on the back of the Ministry of Internal Affairs and Communications' "Comprehensive Rejuvenation Strategy for Towns, People, and Work" is acting as a tailwind for businesses, and projects in various fields including smart agriculture, energy conservation and tourism are being promoted. A list of some of Nihon Enterprise's order track record is provided below. Sales of ¥1.474 billion were recorded during the third quarter of fiscal year May 2016 on the back of a large year-on-year increase in sales of the solutions business resulting from strong demand for solutions and advertising related work. At the same time, the contents services business saw a year-on-year decline in its sales, despite the ability to secure similar level of sales as the previous year in lifestyle contents and an increase in sales of traffic information due to a rise in the number of members. Furthermore, entertainment sales have begun to recover after declining for the past two consecutive quarters. With regards to profits, cost of sales margin rose on the back of an increase in the sales composition of the solutions business, but a decline in sales, general and administrative expenses due in part to lower advertising expenses and the rise in sales allowed operating income to improve from a ¥13 million loss in the previous third quarter to a profit of ¥108 million in the current third quarter. Advertising expenses had risen during the previous first half due to aggressive advertising for games, and during the current first half for traffic information and prefatory sales of collaborating cellular telephone sales companies (Tie-up advertising promotion). These efforts have contributed to an increase in sales of traffic information and contributions from the newly acquired monthly fixed rate subscribing members during the third quarter. At the same time, the spending upon advertising is expected to subside from here forward. Collection of fees from new members acquired through the tie-up advertising promotion in the traffic information services have started. While sales of lifestyle category services had been in a downtrend, they appear to have bottomed after the start of fiscal year May 2016. Efforts have also been implemented to make "Women's Rhythm Pocketbook", "Fivetalk", and "Dealing" strong earnings drivers through alliances. The entertainment category of contents, in which there are over 30 highly popular contents provided over carrier platforms, suffered a decline in sales of contents distributed across carrier platforms due to the diminishing effect of advertising, but conditions within this business appear to be gradually recovering. Strong demand for the consigned development and debugging services conducted by 4QUALIA Co., Ltd., and the contribution of the consolidated subsidiaries and One Inc. and Aizu Laboratory, Inc. allowed sales of the solutions business to rise. Strengthening of sales channels and acquisition of superior contents combined with a rush in demand to beat tighter regulations for cellular telephones to allow sales of advertising to reach a record high level on a quarterly basis. Strong corporate demand allowed sales of handset terminals to trend favorably in the overseas category of solutions. Sales rose by 7.5% year-on-year to ¥4.022 billion. While sales of the contents services business declined by 11.4% year-on-year to ¥1.693 billion due to weak contents sales over carrier platforms, sales of the solutions business rose by 27.3% year-on-year to ¥2.328 billion. At the same time, operating income rose by 32.8% year-on-year to ¥152 million. The increase in the solutions business composition of sales from 48.9% to 57.9% contributed to an increase in the cost of sales margin and a decline in gross income by 1.3% year-on-year to ¥1.771 billion. However, sales, general and administrative expenses declined by 3.7% year-on-year to ¥1.618 billion on the back of reductions in advertising spending from ¥582 million in the previous term to ¥471 million in the current term. The decline in net income is attributed to the decline in extraordinary income from sale of investment securities from ¥331 million in the previous term to ¥17 million in the current term. While difficult conditions were encountered in the contents services business due to the diminishing effect of advertising for contents provided to carrier platforms, some successes of the advertising promotion tie-ups conducted during the first half are being seen in traffic information category. Entertainment (Games, mail, music, digital publications, overseas) and lifestyle categories suffered larger declines in sales, but near term demand appears to be recovering. At the same time, the solutions business benefitted from large growth in sales of consigned development and other solutions services. Also, a strong tripling of handset terminals sales to corporations in China allowed the overseas category to see a strong rise in sales. The influence of the disappearance of extraordinary demand seen in the previous term has been mostly offset and sales of the advertising category (Advertising agency services) remained basically in line with the previous year. Total consolidated assets declined by ¥372 million from the end of the previous fiscal year to ¥5.915 billion at the end of the current third quarter due to primarily to payment of taxes and dividends, and liquidation of investment securities. The decline in cash and equivalents is attributed to payment of taxes and dividends, and an increase in long term deposits as part of Nihon Enterprise's cash management strategy. At the same time, intangible assets grew on the back of software acquisition, and investments rose in response to an increase in long term deposits. Nihon Enterprise maintains no interest bearing liabilities due to the lack of any debt or bonds. Consequent to these developments, capital adequacy ratio rose by 1.7% points from the end of the previous term to 83.9%. Sales, operating income, and ordinary income achieved during the first three quarters of the current fiscal year represent 76.8%, 72.6% and 72.9% respectively of full year estimates for the current term (Similar achievement figures in the previous term were 73.1%, 60.5% and 61.6% respectively). Efforts to develop new contents, improve user engagement, and fortify alliances will be conducted to improve sales of the contents business. At the same time, efforts will be made in the solutions business to capture fiscal year end demand in March. Nihon Enterprise is expected to pay a yearend dividend of ¥3 per share. Investment Bridge identifies two important points of the third quarter earnings results. The first is the success in Nihon Enterprise's efforts to strengthen their competitive capabilities in the contents services business by advertising for the traffic information services in light of the deterioration in the earnings environment for fixed rate carrier services. The second point is strong rise in sales of advertising (Advertising agency services) within the solutions business due to the Company's efforts to strengthen the sales channels and acquisition capabilities for superior contents (Number of collaborating cellular telephone sales companies: 7 at end 2/15, 10 at end 2/16). In addition, favorable demand for the subsidiary Promote, Inc.'s kitting tools for smartphone applications is yet another positive bit of news. In the other services category, efforts are being made to raise the awareness for the cloud based reverse auction system "Profair" including the holding of a cost reductions solution seminar on March 18, and a second seminar held on April 8 and the outcome of their efforts are expected. Since fiscal year May 2011, sales have continued to grow steadily, but profits have not always followed suit. However, the effects of anticipatory investments and success of the focused advertising strategy have begun to appear, and both sales and profits in fiscal year May 2016 are expected to rise for the first time in three fiscal years. Another factor to watch will be the ability of Nihon Enterprise to continue to grow both sales and profits in the next fiscal year.